What are the trade-offs states make when offering economic development incentives to private businesses? Prof. Nathan Jensen discussed this and more on Tuesday, November 13th in the UCA College of Business auditorium to a crowd of over 70 attendees. Jensen is a Professor in the Department of Government at the University of Texas-Austin. He teaches courses and conducts research on government economic development strategies and business-government relations, among other things. He is a coauthor of the book Incentives to Pander: How Politicians Use Corporate Welfare for Political Gain with Edmund J. Malesky of Duke University. The book focuses on political incentives for economic subsidies. However, voter approval for these programs declines once they’re shown some of the tradeoffs. For example, support for using property tax exemptions decreases when people are also asked to consider that this would lower tax revenues that support schools. Jensen concluded his remarks with noting that such incentives rarely change firms’ behavior even though all states engage in such policy. You can watch a video presentation summarizing Jensen’s research here. A video recording of Jensen’s talk will be uploaded to the ACRE Youtube page soon. Jensen’s visit wasn’t the only big news related to incentives on Tuesday. 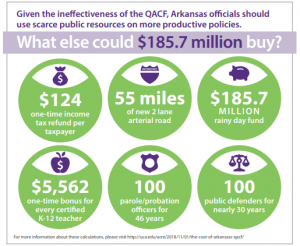 The Arkansas Center for Research in Economics released a new policy review entitled Government Accountability: 5 Fixes for Arkansas’s Quick Action Closing Fund by ACRE Policy Analyst Jacob Bundrick last week. 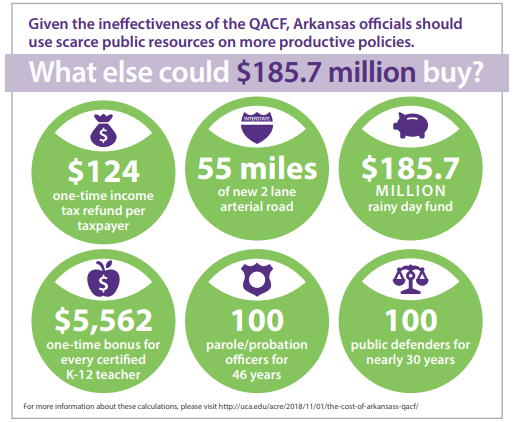 The review outlines five ways Arkansans can improve the transparency and accountability of the program. For a one-page summary of Bundrick’s research on the QACF, go here. The full text of the policy review can be found here. For more of ACRE’s research on targeted incentives, go here.